There’s a massive difference between an amazing cup of coffee and a terrible one. Kevin Johnson knows this — he is the president and Chief Operating Officer of Starbucks, after all. The majority of Kevin’s days are spent inside his office leading the company’s global operational efforts. While this aspect of Kevin’s job is important, he also travels internationally to see where Starbucks grows and harvests their coffee. On first reading this, it might sound like visiting a coffee farm in Costa Rica is a waste of Kevin’s time. Doesn’t he have more important things to do than see where his brand’s coffee beans are grown? Doesn’t Starbucks have employees further down the chain of command who can handle these tasks? Doesn’t the company trust its current farming process? Of course. But how can Kevin Johnson tell people about Starbucks’ commitment to ethically sourced coffee and social environmental leadership if he doesn’t experience the process firsthand? What Starbucks, as an organization, understands is that it’s not enough for its COO to know that their beans are grown in South America — they need Kevin to be fully immersed in the process. They’re not sending Kevin to Costa Rica for a vacation; they’re allowing him to more fully integrate himself into Starbucks’ mission. What was your original vision when you started your business? Did you want to help people in your community? Did you want to offer up an incredible product that had never been made before? Why haven’t you achieved your goal yet? That initial hunger to fulfill your passion is still inside you, but it’s been watered down during the course of your professional journey. Doubts and insecurities have crept in. Life incidents have come up that have taken your attention away from your ultimate goal. Maybe you’re just exhausted from working so hard day in and day out. Let’s face it: Operating your own company is a massive undertaking. Each day presents a new set of challenges and you need to be able to give them your all. Sometimes the best way to accomplish this is by diving even deeper into your business. That doesn’t mean working yourself to the bone or sacrificing time with family and friends. It means consciously choosing to increase your knowledge so you can put optimal effort into running your company. That’s why countless people have attended Tony Robbins’ Business Mastery event. Over the course of five days, you’ll immerse yourself in an intensive business boot camp that will help you reconnect to the original mission of your business and improve upon areas of your company that aren’t working for you. The event focuses on the 7 Forces of Business Mastery, which were designed to help companies, like yours, reach peak success by offering up valuable ways to evolve and improve. Tony Robbins hosts the event and brings together some of the most innovative, hardworking people in the business world. You’ll learn what strategies worked for the top leaders in a variety of fields, what tactics didn’t and how they overcame failures and setbacks in their personal journeys. This last item is especially important — everyone has failures. Failure isn’t what kills a business, but giving up after failure occurs does. Business Mastery gives you access to insights that many people aren’t able to learn in business school. You’ll learn how to identify the areas of pain in your business and how to make them infinitely stronger. Empowering speakers will push you to put the passion back into your business while teaching you to inspire your employees along the way. Discover that the chokehold on the growth of your business is directly related to the psychology of those leading the company. Business Mastery will teach you that in order to overcome plateaus at your company, you need to change the story you tell yourself. When Tony says “Change your story, change your life,” he means it. He continues, “Divorce the story of limitation and marry the story of the truth, and everything changes,” which highlights the ever-present message of Business Mastery. Not sure if this event sounds right for you? 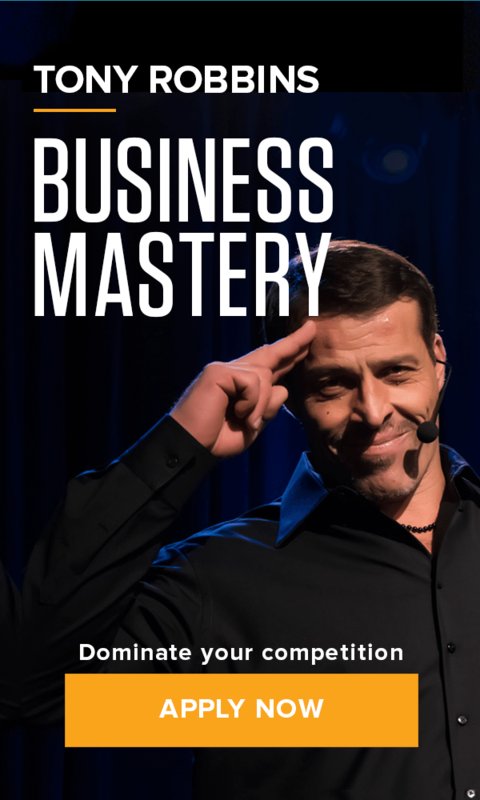 Tony Robbins believes in the power of Business Mastery so much that he’ll offer you a full refund after your first day if you’re not happy with the program. If you don’t see yourself walking away from the event with $1 million value that you can put back into your business after the first day, talk to an on-site representative and receive your money back. This might sound like a bold statement, but Tony is just that confident in Business Mastery. Thousands of people have attended the five-day event and left with not just $1 million worth of value that they put directly back into their business, but $2, $5 and $10s of millions — and you will, too. Take a hard look at your business and ask yourself if it’s where you want it to be. What’s your ultimate goal? What will it take to reach your objective? You’ll find the answers you seek at Business Mastery. By immersing yourself completely into an intensive program that will teach you countless things about not only your business but yourself as a leader, you’ll emerge after an invigorating five days of Business Mastery ready to take on anything that comes your way. Apply now and rediscover your hunger.